During Hollywood’s Golden Age, fashion plates like Cary Grant and Clark Gable went to the Oscars dressed to an accepted standard of elegance. But today’s Tinseltown stars show up at the Academy Awards in a dizzying range of looks from classic to crazy. Today it’s anything goes when it comes to black tie. That’s either terrific or tragedy depending on your point of view, and here are some tips for finding what approach works best for you. If you’re a traditional kind of guy who thinks if it ain’t broke don’t fix it, you’ll feel best keeping the options fairly narrow. That means a matching dinner jacket and trousers, a.k.a. 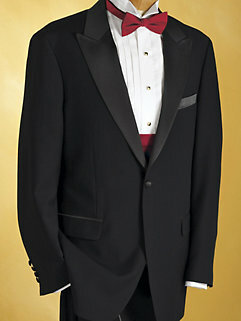 a tuxedo (in black of course, nothing offbeat like midnight blue), a peak lapel and either a single or double-breasted button stance. Personally, I like double-breasted models as they eliminate having to choose between a vest and a cummerbund. The shirt choice is simple: a formal shirt either a standard turndown collar or a wing collar, depending on your preference. Individual style comes from the little things like your stud set, pocket square, and optional dashing accessories like boutonniere, pocket watch, silk socks and patent leather shoes (always black). Some events encourage gentlemen to come attired in “creative black tie.” This is the anything goes category, and can actually be a lot of fun. I once attended an Edwardian-themed ball in black tailcoat, charcoal worsted trousers, waistcoat, blue striped dress shirt with contrast spread collar, black polka dot four-in-hand necktie, black tassel loafers, and boutonniere, pocket square and tie bar. It was a lot of fun mixing formal and daywear elements into a look I thought vaguely retro-English but also personal and idiosyncratic. So you might try wearing tuxedo trousers but substituting a velvet sport coat. For shirts and neckwear, add a standard tie (instead of a bow tie) to your formal shirt, a look that’s been very trendy in Hollywood the past few years. Or wear a basic white dress shirt with French cuffs instead of a formal shirt, and drape a silk scarf around your neck in lieu of a tie. If you really want to make a statement, try a thin wool or silk blend turtleneck or pink oxford buttondown under your dinner jacket instead of a formal shirt. For events specifying cocktail or semi-formal attire, choose a dark suit and a white dress shirt, but add a touch of elegance suitable to evening hours, such as a silver necktie. Whatever you choose, make sure you’re comfortable in it. They say the secret to Fred Astaire’s nonchalant elegance on screen was that he wore his white tie and tails as if they were as comfortable and casual as his beloved tweed jackets and flannel trousers. There is no such thing as creative formal wear. Formal means according to set rules. Black tie or white tie dress is the traditional formal dress of Western Civilization. All sloppy deviations from this code of dress render any formal affair to be merely prosaic. We appreciate you sharing your thoughts with us, Clifton! Can you adress the quesion of whether t wear a vest vs. cummerbund, neck tie vs bow tie? Also – these days even in the “formal” category you see more than just black or white ties / vests / cmmerbunds -you see a variety of colors and patterns. Any houghts or uggstion? It actually all comes down to a matter of personal preference and what you are more comfortable in . All of the looks that you describe are equally as dressy/formal once you have the tuxedo on.